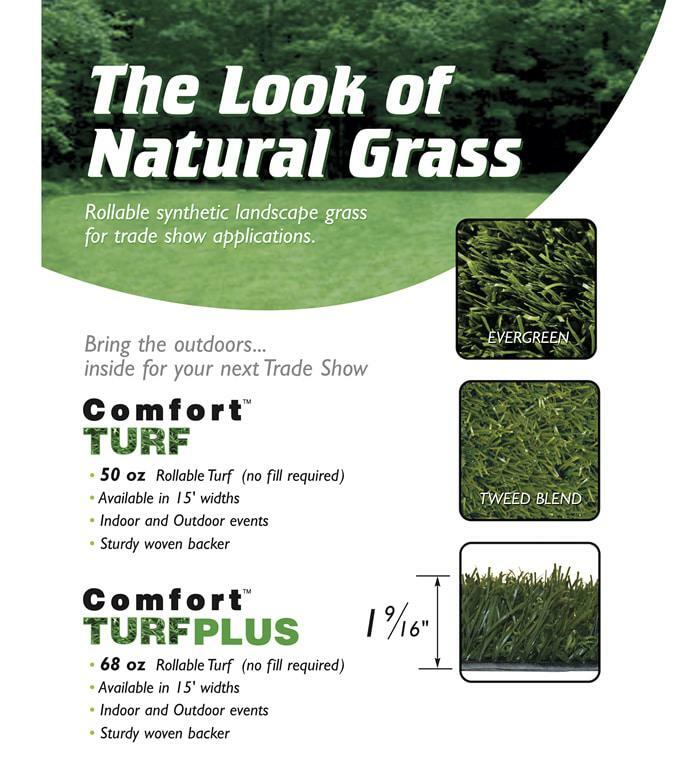 This durable and strong surface is designed to simulate natural grass. Turf flooring is soft, resilient and durable in terms of top-quality trade show flooring options. It offers a heavy-duty backing that makes it ideal for both indoor and outdoor conventions or any event. It allows water, spills or anything essentially to drain from the surface, making it easy to keep clean. It is easy to care for and won’t fade over time even after years of being exposed to the sun. The high-quality backing found on Comfort Turf flooring will not stretch like carpet. This comfortable flooring option can be used for special events including conferences or at retail shops, hotels or stores whose design fits this need. It also is great for permanent installation at fitness centers, commercial properties or even sports centers. Comfort Turf is easy to maintain and the color won’t fade. It looks like natural grass. Bring the outdoors inside for your next expo booth with this rollable synthetic landscape grass. It is available in 15’ widths and comes with a sturdy woven backer allowing it to lay flat anywhere. It is nonflammable and is made of 100% polyethylene, which is free of lead and heavy metals. Choose between two styles to match your exhibition marketing strategy vision. Ultimately, rolled flooring, no matter what kind, is the bread and butter of trade show flooring. It is easy to transport and store and best of all, to install and tack down. When you’re looking for unique flooring that will draw attention to your trade show booth, try Comfort Turf glass flooring today. For more information on Comfort Turf trade show flooring and how it can impress attendees, contact our professional team at Capital Exhibits today!